The completed genome sequences of the malaria parasites P. falciparum, P. y. yoelii and P. vivax have revealed some unusual features. P. falciparum contains the most AT rich genome sequenced so far – over 90% in some regions. In comparison, P. y. yoelii is ~77% and P. vivax is ~55% AT rich. The evolutionary reasons for these findings are unknown. Mobile genetic elements have a considerable impact on genome evolution but a thorough investigation of these elements in Plasmodium has not been undertaken. We therefore performed a comprehensive genome analysis of these elements and their derivatives in the three Plasmodium species. Whole genome analysis was performed using bioinformatic methods. Forty potential protein encoding sequences with features of transposable elements were identified in P. vivax, eight in P. y. yoelii and only six in P. falciparum. Further investigation of the six open reading frames in P. falciparum revealed that only one is potentially an active mobile genetic element. Most of the open reading frames identified in all three species are hypothetical proteins. Some represent annotated host proteins such as the putative telomerase reverse transcriptase genes in P. y. yoelii and P. falciparum. One of the P. vivax open reading frames identified in this study demonstrates similarity to telomerase reverse transcriptase and we conclude it to be the orthologue of this gene. There is a divergence in the frequencies of mobile genetic elements in the three Plasmodium species investigated. Despite the limitations of whole genome analytical methods, it is tempting to speculate that mobile genetic elements might have been a driving force behind the compositional bias of the P. falciparum genome. Mobile genetic elements (MGEs) play a fundamental role as drivers of genome evolution, shaping both genes and genomes and often constitute a large fraction of the genome (for a review of mobile elements and genome evolution see [1, 2]). The mutagenic effects of MGE behaviour are well documented and include a spectrum, from point mutations to whole genome restructuring. In addition, MGEs have occasionally become "domesticated" and evolved to fulfill essential functions in genome dynamics e.g. telomerase . Consequently, MGEs and their derivatives have been identified in almost all organisms. Laboratory evidence has repeatedly demonstrated that MGEs can have either a beneficial  or detrimental  effect on the host's fitness depending on the downstream effects of transposition. To counteract the detrimental effects, some organisms have developed protective mechanisms against invading MGEs, such as the repeat-induced point (RIP) mutation system in Neurospora crassa, which silences repetitive elements by methylation and subsequent mutation of cytidine to thymidine nucleotides . This explains the unusual situation in N. crassa where very few, if any, active MGEs have been detected. MGEs are usually classified according to their mechanism of replication and whether they are autonomous (self-replicating) or non-autonomous (dependant on related elements for replication or mobility) . The two broad groups are those which are mobile via either a DNA or RNA mechanism (Figure 1). The DNA group makes use of a self-encoded transposase that facilitates excision and integration from one site to another, while the RNA group utilizes an RNA intermediate and represents a more functionally and evolutionarily diverse group of elements. MGEs employing an RNA intermediate use reverse transcription to re-invade the genome, increasing their copy number along the way. 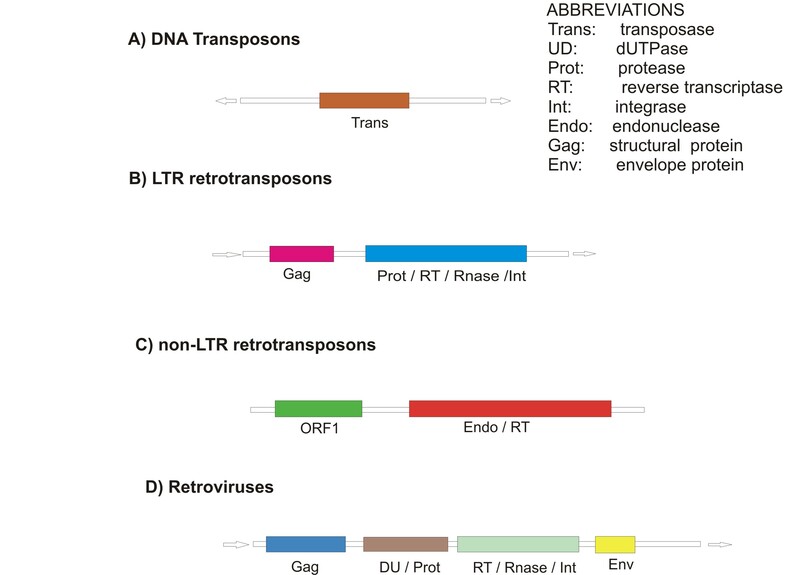 In the RNA group, long terminal repeat (LTR) retrotransposons are evolutionarily related to retroviruses while the non-LTR retrotransposons form a discrete group and transpose via a unique target primed reverse transcription (TPRT) mechanism . An offshoot of the non-LTR retrotransposons is the non-autonomous non-LTR retrotransposon group. These elements lack the enzymatic machinery for self-replication and mobilization and their survival depends on hijacking the replicative machinery of active non-LTR retrotransposons. MGE open reading frames (ORFs) code for the relevant enzymes that are required for replication and transposition (Figure 1). Schematic representation of MGEs. ORFs are represented by coloured blocks. Non-autonomous retrotransposons and mobile introns are not depicted here. Arrows represent flanking repeats. Another intriguing group of mobile elements are the mobile introns. Divided into three groups based on their mechanisms of mobility (for a review of mobile introns see ), these are evolutionarily ancient MGEs and are believed to be the progenitors of non-LTR retrotransposons and eukaryotic spliceosomes. The group II introns have an extraordinary array of enzyme activity, including reverse transcriptase, maturase, RNase H and endonuclease activity as well as functional ribozymes. To date, group II introns have only been found in organellar genomes (chloroplast and mitochondrial) and a few cyanobacteria. Very little is known about the occurrence of MGEs in Plasmodium species and the role they may have played in the evolution of the parasites' genomes. Initial reports after sequencing of the P. falciparum and P. y. yoelii genomes suggested that there may be a complete absence of MGEs in P. falciparum and no comment was made about MGEs in P. y. yoelii [8, 9]. There is bioinformatic and laboratory evidence for the presence of a domesticated derivative of a non-LTR retrotransposon, namely telomerase, in P. falciparum and P. y. yoelii [10–12]. The only other evidence we could find in the literature for MGE-derived or related sequences in Plasmodium spp. are the Alu elements (non autonomous non-LTR retrotransposons) located within the antigen coding genes of P. vivax  and the TAREs (telomere associated repetitive elements) found within the multigene superfamilies that code for antigen variation e.g.var, rif and stevor in P. falciparum . The function of these repeats is uncertain although it is proposed that they facilitate antigenic change and immune evasion. We report here a comprehensive genome analysis of potential MGEs and their derivatives in P. falciparum, P. y. yoelii and P. vivax. This provides further insight into Plasmodium genome evolution with particular reference to the compositional bias in P. falciparum. InterPro and Pfam mobile genetic element signature domains identified in P. falciparum and P. y. yoelii. Seven P. y. yoelii and four P. falciparum ORFs were identified. The ORFs MAL13P1.42 and PY04273 were duplicated by the two InterPro domains IPR002104 and IPR010998. IPR000477 (PF00078) Reverse transcriptase; IPR001584 (PF0065) Integrase catalytic domain; IPR002156 (PF00075) Ribonuclease H fold; IPR001037 (PF00552) Retroviral integrase C terminal; IPR003308 (PF02022) Integrase N terminal Zn binding domain; IPR002050 (PF00429) ENV polyprotein; IPR004875 (PF03184) Endonuclease CENP-B protein; IPR008906 (PF05699) hAT element; IPR003322 (PF02337) retroviral GAG protein; IPR005162 (PF03732) retrotransposon GAG protein; IPR000442 (PF01348) Group II intron-encoded maturase; IPR002492 (PF01498) DNA-binding part of catalytic domain of Tc3 transposase; IPR008042 (PF05380) Aspartic protease from PAO retrotransposon family; IPR000305 (PF01541) Group I excinuclease; IPR003545 Telomerase reverse transcriptase; IPR001162 Excinuclease; IPR006350 Intron endonuclease group I; IPR008180 (PF00692) DeoxyUTP pyrophosphatase; IPR001995 (PF00077) Peptidase A2A, retrovirus; IPR000721 (PF00607) retroviral nucleocapsid protein gag (p24). There were no hits identified in the P. falciparum organellar genomes (ORFs>50 amino acids) in PlasmoDB with E values less than 100 that demonstrated significant similarity to either of the two group II intron HMMs. Where significant similarity did arise, this was due to upstream exons being fused to the mitochondrial group II introns used in generating the HMM, e.g. PFB0795w is the Plasmodium gene orthologue of the ATP synthase gene and corresponds to a fused exon located upstream of several mitochondrial group II introns. The WashU-BLASTP 2.0 search of PlasmoDB using the RT consensus sequence developed in this study, detected two P. y. yoelii (PY00479 and PY03683) and four P. falciparum (PF13_0080, PFC0960c, PFE1555c and PFC0165w) ORFs with similar E values (less than 10). Of the two P. y. yoelii genes, PY00479, which is annotated as a putative telomerase reverse transcriptase in PlasmoDB, was not detected by the InterPro TERT HMM. PY03683 is a hypothetical protein of 48 amino acids, making it too short for any meaningful comparison, and was not investigated further. Of the four P. falciparum genes only PF13_0080 and PFE1555c appear to have significant non-random homology in the most conserved residues, despite the E values of all four being similar. PF13_0080 is annotated as a putative telomerase reverse transcriptase in PlasmoDB and bioinformatic evidence for this has already been published [11, 12]. PFE1555c is a hypothetical protein. An alignment of the RT consensus sequence generated in this study with these two genes is demonstrated in Figure 2. Some of the highly conserved residues, as well as some residues shown to be essential for RT activity, are present in both sequences. The RT consensus sequence was also used to probe the P. vivax genome available from TIGR . A WashU-BLASTP (E value = 1, Blosum35 matrix) search revealed one hit that demonstrated significant similarity to the RT domain, including many of the highly conserved residues. This ORF (Pv122530) exhibits significant sequence similarity to the putative TERTs in P. falciparum and P. y. yoelii. Figure 3 is an alignment of these two sequences with the putative P. vivax TERT (PvTERT) which is reported here for the first time. An orthologue of the PFE1555c gene, Pv079710, was identified by a simple BLASTP search of the P. vivax genome. Ten P. vivax ORFs were identified by a BLASTP homology search as orthologues of the P. y. yoelii and P. falciparum genes located in InterPro (without a corresponding match in Pfam). HMMER searches of the P. vivax genome using Pfam_fs HMMs identified 28 ORFs containing MGE domains. In total therefore, 40 P. vivax ORFs containing MGE domains were identified and these are listed in Table 2. P. vivax ORFs containing MGE domains. 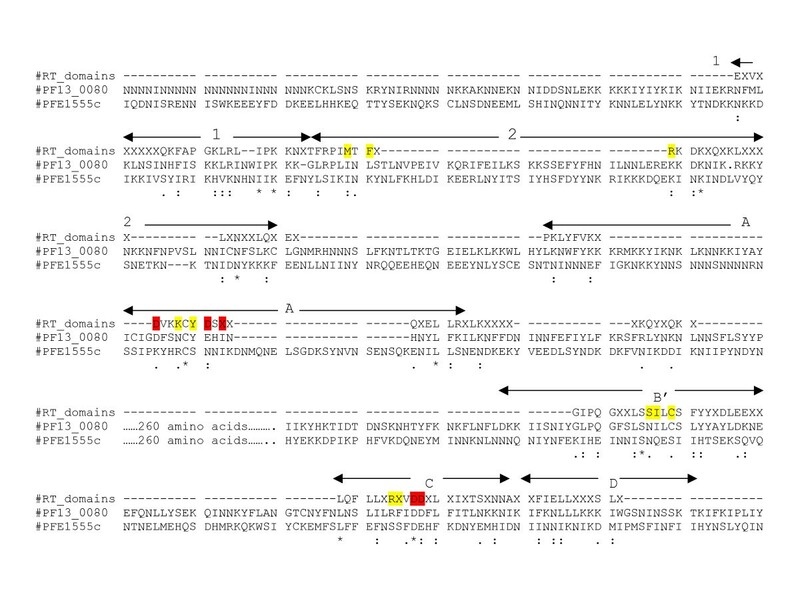 ORFs containing MGE domains were identified in the genome in three ways: i) a HMMER search using Pfam_fs HMMs ii) a BLASTP search using the RT consensus sequence developed in this study, and iii) a BLASTP search using the P. y. yoelii and P. falciparum MGE domain sequences identified from InterPro but not located in Pfam. Only the Pfam entries with significant hits are listed. We report here the presence of MGE signature domains in potential protein coding sequences of three Plasmodium species: six in P. falciparum, eight in P. y. yoelii and 40 in P. vivax. In each species there are three potential domesticated derivatives of MGEs. They are meiotic recombinase, DNA repair protein rad51 and TERT. Although these three proteins are common to all eukaryotes and are no longer active MGEs, they have clearly defined MGE domains and are included for completeness. Recently, identification of the putative TERT genes in P. falciparum and P. y. yoelii has been of interest and bioinformatic evidence of this has been published [11, 12]. We have identified a candidate for the TERT orthologue (PvTERT) in P. vivax using the conserved RT sequence developed in this study (Figure 3). We cannot discount that other, as yet uncharacterized, domesticated derivatives may be among the ORFs detected. Of the remaining ORFs identified, only three are present in P. falciparum. One is homologous to the catalytic domain of a phage integrase, a second to an intron-encoded nuclease and a third to a reverse transcriptase. Although the latter does not contain all the highly conserved residues, there is significant homology to the RT consensus sequence used in this study and warrants further investigation (see Figure 2). The highly conserved "DD" motif, located in domain C, aligns with a "DE" residue pair in PFE1555c. While almost all RT sequences have been found to contain the "DD" motif, some non-LTR retrotransposons used in InterPro to generate the RT HMM (IPR000477) have a glutamic acid (E) substitution for aspartic acid (D). There were seven ORFs identified in P. y. yoelii with similarity to signature domains of MGEs: two transposases, two phage integrases, one intron-encoded nuclease and two domesticated derivatives. One of the ORFs with similarity to a phage integrase domain was a putative yir 3 protein (PY05943). The yir family in P. y. yoelii is analogous to the rif, stevor and var superfamilies in P. falciparum where recombination events play an important role in antigen switching. Analysis of the P. vivax genome yielded a relatively large number of RT domains, 23 in total. The reasons for this are not clear and require further investigation. The InterPro entries for TERT failed to detect the two TERT orthologues in P. falciparum and P. y. yoelii, probably due to the stringency of the HMM search. This highlights the pitfalls of using generic bioinformatic programmes for studying a genome as exceptional as that of Plasmodium. The problems associated with using bioinformatic methods to compare divergent sequences have been discussed before . It must be stressed therefore that the findings presented here cannot be extrapolated further than the limits of the methods used. In particular, MGE detection in compositionally biased genomes may be affected by the lack of sensitivity of the scanning techniques employed. It is also possible that not all MGEs have been described to date and therefore not detected in this comparative study. We did, however, refine the genome mining process in two ways. Firstly, we employed biological data (crystal structure and point mutation data for RT sequences) to generate a consensus RT sequence to expand the scanning process. This increased the sensitivity and detected the P. y. yoelii and P. falciparum TERTs and the PFE1555c ORF discussed above. Secondly, less stringent statistics were used in the scanning process. While it is more common to use E values of 10-5, we used values of 1 or 10. Despite the relatively high E values there were few positive hits (see Results) and we eliminated potential false positives by excluding sequences that demonstrated random homology patterns or which demonstrated no homology in the conserved domains. To further refine and validate our data we excluded ORFs that could potentially represent contaminating DNA. This was done by scanning the genomes of the vertebrate hosts that were used in the respective sequencing projects. All available Saimiri boliviensis boliviensis sequences and the related Mucaca mulatta genome were searched for ORFs with similarity to the potential P. vivax MGEs identified in this study. Similarly, the Mus musculus and the Homo sapiens genomes were scanned for ORFs with similarity to the potential MGE domains detected in P. y. yoelii and P. falciparum respectively (see Methods). No potential contaminating vertebrate host DNA was identified amongst the potential P. vivax and P. falciparum MGE domains. However, several P. y. yoelii sequences demonstrated >80% identity to ORFs in the M. musculus genome and were rejected from the data as being contaminating sequences. These were PY06984, PY07613, PY07841, PY07669, PY07288, PY06363 and PY07014. The fact that these ORFs have homologues in other rodents e.g. Rattus norvegicus, confirms they are contaminating sequences. Given the above limitations and that the evidence presented here would need to be confirmed experimentally, these findings raise some interesting questions. While there are potentially several MGEs of different classes in P. y. yoelii and P. vivax, P. falciparum appears to contain very few. MGEs are ubiquitous in nature and are considered important catalysts for genome evolution. An interesting exception is the fungal genus Neurospora, which has the widest array of genome defence mechanisms found in eukaryotes, including the repeat-induced point mutation (RIP) mechanism whereby cytidine is mutated to thymidine [20, 21]. This has had a profound impact on the organism's genome: it has extinguished active MGEs and driven the genome to become AT-rich, particularly in the non-coding regions . Since the discovery of RIP-induced MGE silencing in Neurospora, this mechanism has been demonstrated in all kingdoms of life. Most recently, Kuhlmann et al have demonstrated that a RIP-like mechanism is capable of silencing retrotransposons in Dictyostelium . This not only extinguishes MGE activity, but drives the AT bias in repeated sequences by subsequent deamination of methylated cytidine residues. These two features – an AT-rich genome (increasing to ~90% in non-coding regions) and an apparent lack of active MGEs – are notable features of P. falciparum. In addition, two putative DNA methyltransferases (PF11_0284 and PF13_0286) and a putative cytidine deaminase (PF13_0259) have been identified in P. falciparum, suggesting that the potential exists for methylation and deamination of cytidine residues in the genome. i) A genome protective mechanism, such as the RIP-induced silencing of transposable elements, has been a potential driving force behind the compositional bias of the P. falciparum genome. ii) The AT-rich genome of P. falciparum has been selected for as a result of its inherent resistance to MGE invasion. The finding that the putative RIP machinery is represented in the P. falciparum genome lends support to the first hypothesis. The second hypothesis is based on findings that various MGEs may require specific recognition sequences as potential sites for integration e.g. the mariner element from Drosophila mauritiana appears to recognize specific nucleotide patterns as potential sites for integration . A comprehensive genome analysis of the three complete sequences of P. falciparum, P. y. yoelii and P. vivax revealed that a decrease in the frequency of transposable elements coincides with an increase in AT bias. A causal relationship between these two parameters remains to be established since there are limitations in the currently available bioinformatic screening methods. However, the hypothesis that a genoprotective mechanism exists in P. falciparum and that this may contribute to the compositional bias should be considered. Whole genome analytical methods that are particularly suited to compositionally biased genomes would be of value in further understanding the P. falciparum genome. (i) for signature domains : transposase, reverse transcriptase, ribonuclease, integrase, protease, endonuclease, zinc finger, GAG polyprotein, maturase and recombinase. (ii) for classes of MGEs: transposon, retroelement, retrovirus, non-LTR retrotransposon, LTR retrotransposon and group II introns. Chloroplast: X04826 (trnK I1), Z00044 (trnK I1), Z11741 (trnK I1), JN0302 (trnK I1), X52765 (trnK I1), X15901 (trnK I1), X57097 (trnK I1), D11467 (trnK I1), X04465 (trnK I1), P19593 (petD I1), X55877 (rbcL I1), X70810 (psbC I2, psbC I4 and psbD I8). Mitochondrial: X57968 (nad1 I4), M63034 (nad1 I4), M30176 (nad1 I4), M68929 (SrDNA I1, atp9 I1, atpA I1, atpA I2, cob I3, coxI I1, coxI I2, coxII I2), X14669 (coI I1), X55026 (COI I1, COI I4, ND5 I4), M62622 (cox1 I1, cox1 I2), X57546 (cox1 I1), X54421 (cob I1). The software package HMMER 2.3.2  was used with default settings to generate HMMs. Only the P. falciparum organellar genomes were investigated. The RT domain is common to all MGEs (including group II introns), except DNA transposons, and has been the most intensively studied MGE domain. However, the divergent and abundant nature of RT containing sequences makes it difficult to construct a meaningful HMM or consensus sequence for use in BLAST searches and alignments. Based on biochemical knowledge of the RT domain such as its crystal structure and point mutation data [29, 30], we generated a RT consensus sequence. This complimented the detection of potential MGEs and these findings were validated by comparison with the results from the InterPro and Pfam databases. Six of the seven conserved regions common to most RTs were included, namely domains 1 and 2 (fingers) and domains A, B', C and D (palm). Domain E (thumb) was not included as it was not possible to generate a meaningful sequence using this method (for a review of RT domains in MGEs see ). i) Residues that were determined by crystal structure of a retrovirus RT to have sidechain or mainchain contact to either nucleic acid, dNTPs or Mg2+ cofactor  and that were present in at least one of the six retroelements above were inserted in the consensus sequence. ii) Amino acid residues that have been demonstrated to be essential for RT activity in vitro  were inserted in the consensus sequence. iii) A ClustalW alignment  (software available at ) with default parameters of the six sequences used to generate the consensus sequence was analysed. Where the same residue was present more than once in the same position in the alignment, it was considered significant due to the diversity of the alignment and was included in the consensus. If there was more than one residue represented more than once, both residues were included as alternatives at that position. Table 3 shows the final RT consensus sequence used in the analysis. The six conserved domains used in this study to represent the RT sequence of RT-encoding MGEs. Alternative amino acid residues are in brackets. 'X' is any residue. 1 – residue present in three or more of the six aligned sequences; 2 – residue present in four or more of the six aligned sequences; 3 – residue in contact with nucleic acid template, dNTP or Mg2+ ; 4 – point mutations of this residue abolish catalytic activity. MGE domains in InterPro and Pfam were investigated for P. falciparum and P. y. yoelii entries. The chloroplast and mitochondrial group II intron HMMs were used to search the P. falciparum organellar genome in PlasmoDB release 4.4 using the software package HMMER 2.3.2. Pfam_fs HMMs were extracted from the database and used to search the P. vivax genome in TIGR. An E value of 1 and the individual trusted cutoff value for each Pfam entry were used in mining the P. vivax genome so that results could be compared. Since not all InterPro entries have a corresponding Pfam entry, P. falciparum and P. y. yoelii sequences located only in InterPro were used to search for orthologues in P. vivax using WashU-BLASTP at TIGR. P. falciparum was cultured in human blood and P. y. yoelii and P. vivax were cultured in their respective host organisms in the sequencing projects [8, 9, 34]. MGE signature domains that represented contaminating vertebrate host DNA were therefore excluded from this study. For P. y. yoelii this was done by a BLASTP search of the M. musculus genome. The complete genome of S. boliviensis boliviensis (P. vivax host) has not been sequenced. We therefore screened the available S. b. boliviensis sequences as well as the complete genome of a related primate, Mucaca mulatta, for any of the P. vivax MGE domains identified. 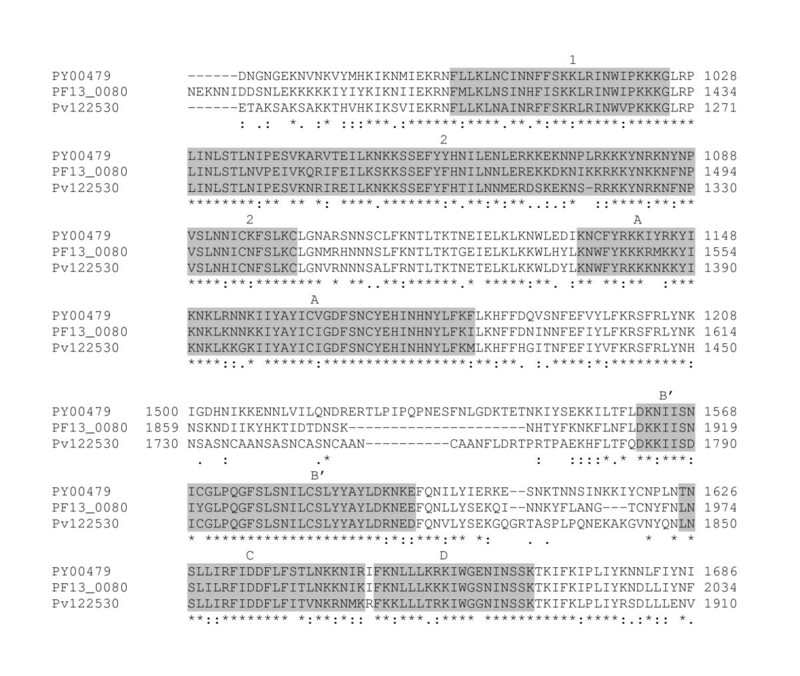 The P. falciparum MGE domains were screened against the human genome. The genomes of M. musculus, M. mulatta and H. sapiens are available at . Funding received from the University of the Witwatersrand Endowment Fund and National Health Laboratory Service, Johannesburg and the National Research Foundation, South Africa under GUN 2051859. Sequence data for the P. vivax genome was obtained with permission from The Institute for Genomic Research. Sequencing of the P. vivax project was accomplished with support from National Institute of Allergy and Infectious Diseases (NIAID), the US Department of Defense (DoD), and the Burroughs Wellcome Fund. PD conceptualized and designed the study, carried out the analysis and drafted the manuscript. AO assisted with and critically reviewed the bioinformatic methods. TC conceptualized the inclusion of P. vivax in the study, helped draft the manuscript and gave considerable intellectual input in analyzing the results. All authors read and approved the final manuscript.